Seven years ago, David Peralta was pitching in the Cardinals organization. A year ago, he was playing the outfield in independent ball. On Tuesday night, he showed that the ceiling on his big league potential remains high. The D-backs prospect went 4-for-4 with a pair of homers, including a grand slam, and a career-high seven RBIs as Double-A Mobile crushed Huntsville, 13-2, at Joe Davis Stadium. "It was a pretty impressive day," BayBears manager Andy Green said. "First, he doubled to center field, then he hit the grand slam to left, then he homered to right. You don't see that too often." After undergoing multiple shoulder surgeries and getting released by St. Louis in 2008, Peralta moved to the outfield in the independent American Association, where he played for three teams in 2 1/2 seasons. 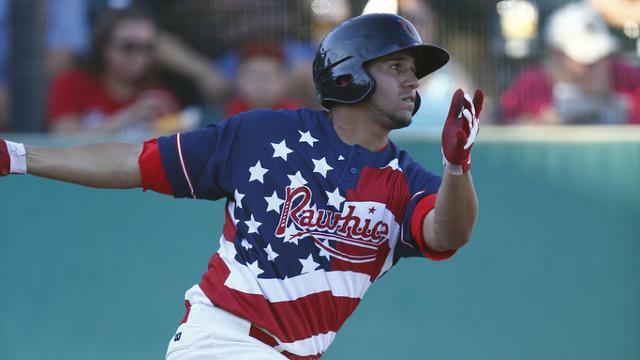 Arizona began following him in January 2013 and, after he batted .352 with 38 RBIs in 42 games with the Amarillo Sox, purchased his contract last July. "In the Minors, you can find a lot of young arms, you just have to work hard every time," the 25-year-old Venezuela native said. "[I've] been working on timing, being smart at home plate, taking good pitches, being patient. That's going to help me to succeed." Last season, Peralta hit .346/.370/.534 in 51 games for Class A Advanced Visalia. He committed only error in 78 chances while recording four outfield assists. Against the Stars, he ripped an RBI double in the first inning, drew a leadoff walk in the third, then capped a five-run fourth with his second career grand slam. Peralta added a two-run shot in the sixth that gave him the Southern League lead with 19 RBIs. "He's been a great hitter all year, it just finally clicked as far as power production," Green said of Peralta, who chipped in a single and scored in the eighth. "His makeup is outstanding, he has the attitude and desire to learn, he possesses power and strength, he just needs to gain experience. He has a lot of upside." Green, who played for the D-backs and Mets from 2004-09, also said Peralta could see time at first base as the season progresses. Peralta hit right behind Justin Greene, who went 5-for-5 with four runs scored and three RBIs. It was his first career five-hit game and raised his batting average 82 points to .204. Sean Jamieson chipped in two hits, an RBI and a run scored as Mobile totaled a season-high 17 hits. "That was a great game for everybody, I'm proud of everyone," Peralta said. "We've been working hard every day [and] we've got a great team." Michael Lee (2-2) was the beneficiary of the BayBears' explosion as he won his second straight start. He allowed two runs -- one earned -- on five hits while striking out six over six-plus innings. Stars counterpart Taylor Jungmann (1-2), the Brewers' No. 9 prospect, surrendered eight runs -- five earned -- on eight hits while fanning five over five frames.